Chikungunya is a viral infection caused by chikungunya virus belonging to family Togaviridae, transmitted by Aedes mosquitoe. It presents with acute onset of fever with debilitating arthralgia/ arthritis. A spectrum of muco-cutanous manifestations have been reported in the literature. We report a case of a 35 years old female presented with non-progressive hyperpigmented macules in a segmental pattern over the left side of the neck for the past 1 month. She had a preceding history of chikungunya diagnosed on clinical and serological grounds just 2 weeks prior to the onset of pigmentation. Histopathology showed increased melanin deposition in the basal layer of the epidermis with presence of melanophages in the upper dermis. There was no basal cell vacuolization or inflammatory infiltrates. These findings were consistent with a diagnosis of post chikungunya pigmentation. Patient responded well to treatment of topical 2% hydroquinone. This unique segmental presentation of post chikungunya pigmentation must be kept in mind when a patient presents with an acquired segmental hyperpigmentary disorder of unknown origin. Chikungunya, Aedes mosquitoe, Hyperpigmented, Segmental pigmentation. Chikungunya is a viral infection caused by chikungunya virus belonging to family Togaviridae, transmitted by Aedes mosquitoe . It presents with acute onset of fever with debilitating arthralgia/arthritis . It is often associated with a variety of mucocutaneous manifestations seen during both acute as well as convalescent phase . We report a case of post chikungunya hyperpigmentation in a rare segmental pattern. To the best of our knowledge this has never been reported before in the literature. A 35 years old female presented with asymptomatic nonprogressive hyperpigmented flat lesions over the left side of the neck for the past 1 month. There was no preceding history of topical applications or use of perfumes or fragrance. She didn’t notice any preceding inflammation over the lesions. However, she had history of preceding episode of high grade fever associated with severe joint pain that occurred around 2 weeks prior to the onset of the pigmentation. The arthralgia was symmetrical and polyarticular involving bilateral knee, elbows and small joints of hands and feet. There was no history of bleeding from any orifice, retrobulbar pain or any ocular complaints. Her previous records showed hematological investigations including hemoglobin, leucocyte count and platelet count to be normal. Dengue serology was negative, while serology for chikungunya was positive. On examination, she had multiple hyper pigmented macules colaescing to form a larger macule over the left side of the neck extending from supraclavicular area, crossing the submandibular area till the mandibular process in a segmental pattern, not crossing the midline (Figure 1). There was no atrophy, telangiectasias or any other surface changes. Rest of the muco-cutaneous and nail examination revealed no abnormality. Based on clinical presentation and morphology; and positive chikungunya serology a diagnosis of post chikungunya pigmentation was made. 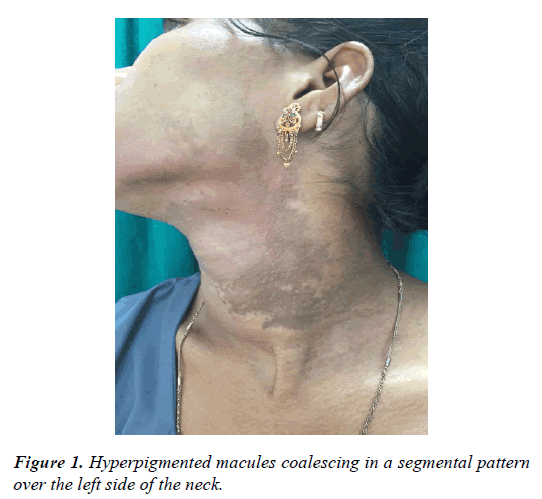 Figure 1: Hyperpigmented macules coalescing in a segmental pattern over the left side of the neck. A skin biopsy was done and sections stained with hematoxyline and eosin. Histopathology showed increased melanin deposition in the basal layer of the epidermis with presence of melanophages in the upper dermis (Figure 2). There was no basal cell vacuolisation or inflammatory infiltrates. These histopathological findings collaborated with the diagnosis of post chikungunya pigmentation. 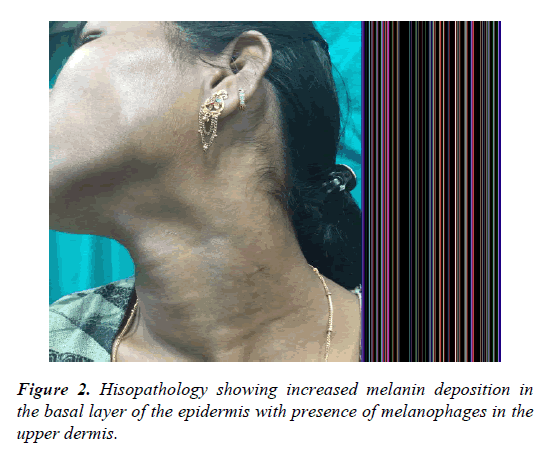 Figure 2: Hisopathology showing increased melanin deposition in the basal layer of the epidermis with presence of melanophages in the upper dermis. Patient was counseled about the condition and advised photoprotection and broad-spectrum sunscreen. She was started on topical hydroquinone 2% at night. A marked improvement was seen in follow up visit at 2 months (Figure 3). Figure 3: Decreased pigmentation after 2 months of treatment with topical hydroquinone 2%. Chikungunya Fever (CF) is an acute viral illness caused due to chikungunya virus (CHIK V) which is a arthropod borne virus (genus Alphavirus) belonging to Togaviridae family. It is transmitted by bite of Aedes aegyptii and Aedes albopictus mosquito. It usually presents with fever and polyarticular arthralgia/arthritis most commonly affecting the small joints of hands and feet. It tends to resolve spontaneously, usually within 2 weeks. It has also been known to cause ocular and neurological complaints [1,2]. A spectrum of muco-cutanous manifestations have been reported in the literature that have been recorded during both acute as well as the convalescent phase of the disease [3-6]. The most common muco-cutaneous manifestation has been found to be morbilliform eruption [3,4]. Other presentation like facial flushing, xerosis, aphthous-like ulcers, scrotal and perineal ulcers, vesiculobullous lesions, vasculitic and lichenoid eruptions, and exacerbation of pre-existing pigmentation have also been reported [3-5]. The pigmentary change seen in CF is most commonly of macular type of hyperpigmentation which can be persistent in nature. It may occur after the resolution of rash and fever. Patients usually give history of a chikungunya like fever 2-4 weeks prior to the pigmentation as was observed in our patient. Because of this reason, it is also called post chikingunya pigmentation (PCP) [3,4,7]. The most common site to get affected is the sun exposed areas such as the face and nose which can present in a variety of patterns like centrofacial, freckle-like, diffuse, flagellate, addisonian , periorbital and palmar pigmentation [7,8]. However, PCP in a segmental pattern has never been reported prior to this report. The pathogenesis for pigmentation is still not clear. It is proposed to be post inflammatory pigmentation or an increased retention of intra epidermal melanin triggered by the virus histopathology of the pigmented lesion usually shows a unique increase of melanin in the basal layer with pigment incontinence and melanophages with or without lymphocytic infiltrates [3,5,8]. Treatment of post chikungunya pigmentation consists of sunprotection and demelanising agents which can be combined with topical steroids. Our patient responded quite well to hydroquinone 2% cream in a very short span of time [3,4]. Chikungunya fever is associated with a number of recently reported dermatological manifestations. However, this unique segmental presentation has been reported to draw the attention of other clinicians to rule out a prior viral fever such as chikungunya when they come across an acquired segmental hyperpigmentary disorder of unknown origin. Goupil BA, Mores CN. A review of chikungunya virus-induced arthralgia: Clinical manifestations, therapeutics, and pathogenesis. Open Rheumatol J 2016;10:129-40. Thiberville SD, Moyen N, Dupuis-Maguiraga L, et al. Chikungunya fever: Epidemiology, clinical syndrome, pathogenesis and therapy. Antiviral Res 2013;99:345-70. Bandyopadhyay D, Ghosh SK. Mucocutaneous manifestations of Chikungunya fever. Indian J Dermatol 2010;55:64-7. Bhat R, Rai Y, Ramesh A, et al. Mucocutaneous manifestations of chikungunya fever: A study from an epidemic in coastal Karnataka. Indian J Dermatol 2011;56:290. Riyaz N, Riyaz A, Abdul Latheef EN, et al. Cutaneous manifestations of chikungunya during a recent epidemic in Calicut, north Kerala, south India. Indian J Dermatol Venereol Leprol 2010;76:671-6. Seetharam KA, Sridevi K, Vidyasagar P, et al. Manifestations C. Cutaneous manifestations of chikungunya fever. Indian Pediatr 2012;49:51-3. Srivastava A. Hyperpigmentation and chikungunya fever. An Bras Dermatol 2016;91:860-1. Chavan RB, Sakunke AS, Belgaumkar VA, et al. Varied cutaneous manifestation of chikungunya fever: A case series 2017;3:289-92.